In memory of different colors represent a loved one lost to suicide during the American Foundation for Suicide Prevention "Out of Darkness" Community Walk at Edinburg Municipal Park Saturday Jan.06,2018, in Edinburg. 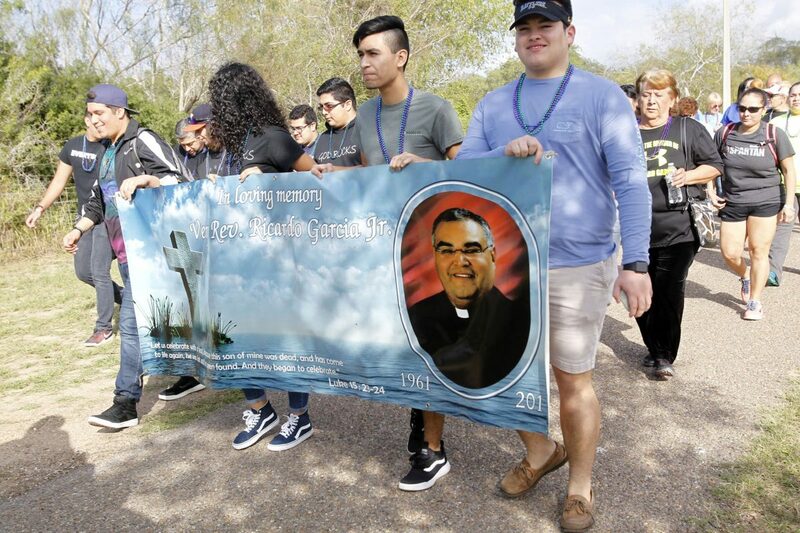 EDINBURG — Strength through somber times is what the 6th Annual Out of the Darkness community walk stood for Saturday. Held at the Edinburg Municipal Park, about 500 participants gathered under the north pavilion for the walk around the park as a way of reflecting those who have gone too soon due to mental health issues. Mental health includes the state of emotional, psychological, and social well-being. It is processed in how we think, act and feel. It also includes someone’s mood or behavior. Some factors may include biological factors, such as genes or brain chemistry, life experiences, such as abuse and family history of mental health problems. Melissa Hinojosa-Zamora, founder for the American Foundation for Suicide Prevention Southern Texas Chapter, started the nonprofit organization locally in memory of her father, Miguel Hinojosa. 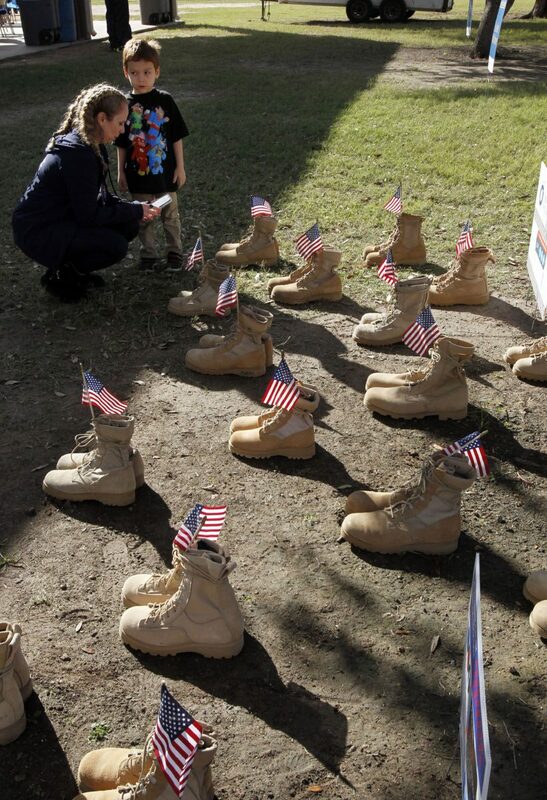 Melissa Hinojosa-Zamora checks her phone near a display of combat boots to bring awareness to suicide during the American Foundation for Suicide Prevention "Out of Darkness" Community Walk at Edinburg Municipal Park Saturday Jan. 6, 2018, in Edinburg. Many attend the American Foundation for Suicide Prevention "Out of Darkness" Community Walk at Edinburg Municipal Park Saturday Jan.06,2018, in Edinburg. 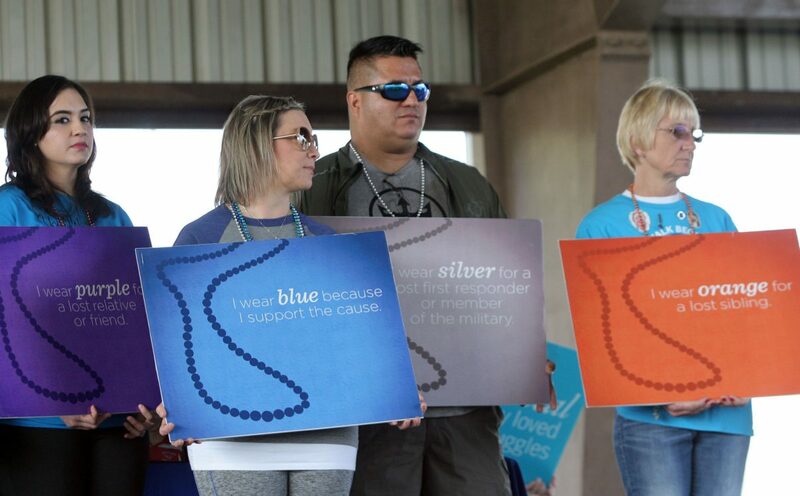 Wearing their different color shirts and displaying their loved ones, many attend the American Foundation for Suicide Prevention "Out of Darkness" Community Walk at Edinburg Municipal Park Saturday Jan.06,2018, in Edinburg. “My father died in 1980 when I was a child,” Hinojosa-Zamora explained. “It took a long time for me to understand it, so I did research to find out more information about it. As the conversation progressed, the friend told Hinojosa-Zamora that she too lost her brother to suicide. They continued sharing stories and learned they had similarities related to what had occurred and through that sharing the Southern Texas chapter was established in the Rio Grande Valley. Melissa “Missy” Garcia Moreno lost her sibling to suicide and has become co-founder for the American Foundation for Suicide Prevention Southern Texas Chapter. She shared that she sometimes goes through waves of emotions at times. Garcia Moreno lost her brother Ricardo at the age of 49 to an apparent suicide in February 2011. He was a priest in Brownsville. The family eventually found out he was depressed and taking medication. 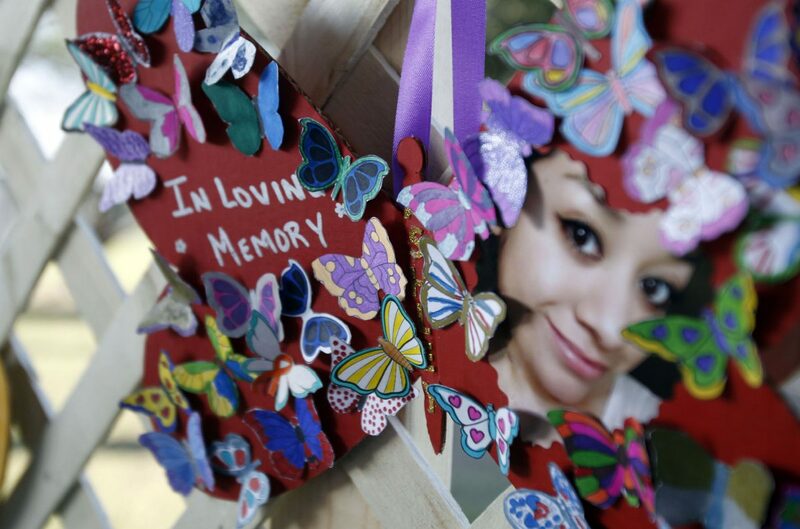 “There’s such a stigma here in the Valley that actually, as a family, we decided not to tell people how my brother died, due to having fear of the questions.” Garcia Moreno said. She is also a teacher with the Edinburg school district and sometimes witnesses students acting differently within the schools, like bullying through social media. Another family who experienced this heartache is the Ybarras. 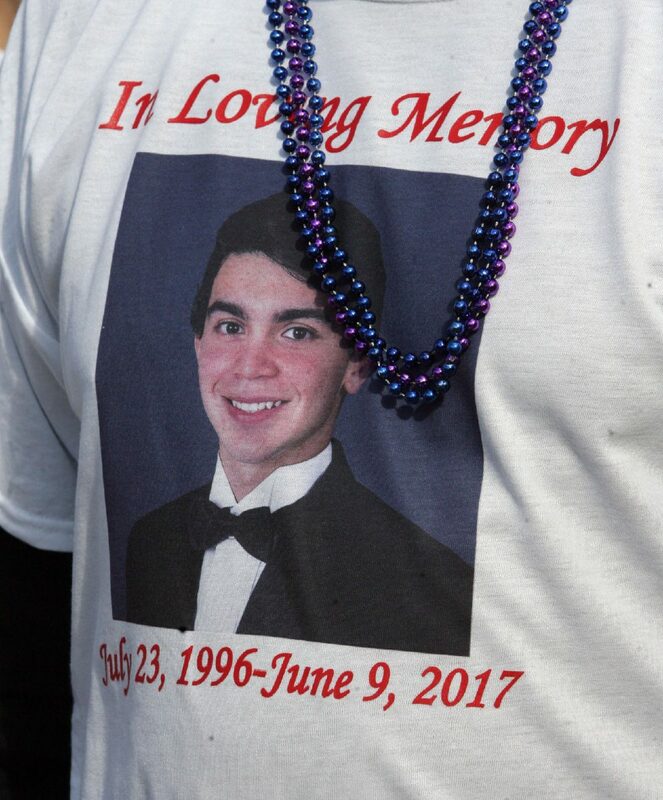 Joe and Sandra Ybarra lost their 20-year-old son Jonathan in 2016 to suicide, as well. “I think he got to his lowest for some reason. One day, out of nowhere, he decided to do it,” she said. Sandra recalls him having problems throughout his short life and didn’t tell anyone, not even family about it. The parents recalled sometimes, he would say, “I hate my life,” but wasn’t sure why he did it and it was something unexpected. During the event Saturday, in an area of the north pavilion, there were several ways to remember a loved one. To one side stood a lattice filled with cardboard butterflies that were hung by families. Some expressed sentiments such as “I miss you so much” to “We will love you forever.” Others had photos of loved ones. For more information on the nonprofit organization RGV chapter visit them at www.facebook.com/AFSPRGV or the national page, www.afsp.org .